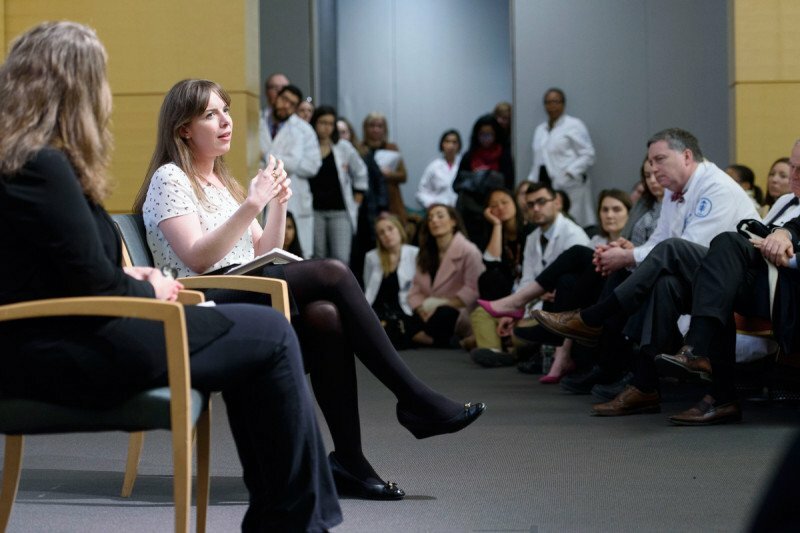 Lucy Kalanithi addressing MSK employees on February 2. Lucy Kalanithi shared her experience as a caregiver for her husband, Paul, a neurosurgeon and author who passed away from lung cancer in March 2015. Lucy Kalanithi already had tears in her eyes as she took the stage before hundreds of MSK employees on February 2. Just moments before, Physician-in-Chief and Chief Medical Officer José Baselga introduced Dr. Kalanithi with a video tribute featuring her late husband, Paul, a neurosurgeon who wrote When Breath Becomes Air, a memoir about his residency and illness, before he died of lung cancer in March 2015. For an hour, Dr. Kalanithi spoke strongly and measuredly about her husband’s life and death and about her experience with suffering, caregiving, and practicing medicine. Terri Gilewski, an MSK physician who runs the Art of Medicine lecture series for MSK employees, conducted the live interview. Following the presentation, we spoke with Dr. Kalanithi more about her identity as a physician and caregiver, her husband’s love of literature, and her feelings about writing. How did your husband’s cancer diagnosis change the way you practice medicine? It gave me an emotional depth to something I was already striving for — helping patients get care that aligns with their values and priorities. Part of this had to do with watching Paul’s oncologist ask what was important to him in that moment. She understood that it was an evolving process. I actually don’t work in such life-and-death situations. Most of my work is done in urgent care. 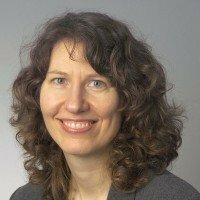 But I do ask people things like, “Why were you hoping for an antibiotic for your cough?” Most people don’t actually need them, but they may be harboring a particular worry that’s bigger than just a cough — they may worry they have pneumonia or that they won’t sleep before a big presentation at work. So rather than addressing only the nuts and bolts of their healthcare — debating the need for an antibiotic — I want to get at their underlying hopes or fears. It may lead to surprising new choices (in this example, alternative tests or treatments, or just reassurance). Our bodies harbor our identities, and sometimes even small healthcare decisions are important emotionally. Paul’s diagnosis made me more viscerally aware of the need to uncover all of that. You mentioned today that Paul told his family and friends, referring to you, “Take care of her so she can take care of me.” What did you learn about being a caregiver? Paul used to say that I had the harder job. I don’t agree with that, but I appreciated him saying it. His entire support system was really going through it together and the amount of help we all needed — both logistically and to cope — was huge. Caregiving was not just about logistics. It was about helping Paul maintain his identity even when his body was failing. It became really clear to me that I wanted to help him maintain his sense of personhood and self. As a young neurosurgeon, he was pretty used to being in charge. Becoming quickly debilitated and losing control was hard for him. I still asked him for advice, and I told his friends they could ask him for advice. We talked about raising our child together. It was all completely separate from the fact of his becoming more disabled. Do you think Paul’s love of literature made him a more empathetic doctor, even before he was a patient? I think he did see medicine as a calling and thought most about the humanistic aspects of it before entering medical school. I think some physicians start out with the nuts and bolts and then come to realize that the center of their job is the humanistic part — it’s a place where everyone ends up. I also believe that having read so much literature and then practicing medicine prepared him to be a patient. It internalized the idea that suffering is a core part of being human. That isn’t really part of modern culture, to acknowledge the lack of control we have. How has writing affected you — writing the epilogue for the book and the New York Times essay? I hate writing. I watched Paul write the book and it seemed largely pain free. For me, writing was nothing like that. I was wrestling the words onto the page. But it ended up being really helpful to put words to how Paul died and reflect on what’s been happening ever since. I think the fact of connecting with other people over those experiences, especially grief and loss — whether as a physician or as a person doing a book tour — it has been really sustaining. It makes me feel less singled out. There are all these versions of suffering. It makes me feel so grateful for having a healthy child and all the support we had. What’s the purpose of this book tour and why are you doing it now? I would’ve done anything for the book and to fulfill Paul’s hope that this book would be out in the world. There’s also a personal piece of it that’s been so helpful during a time of grief, to connect with what actually happened. I’m still actively processing it when I’m speaking, just like Paul was when he was writing. As a physician, it’s been great to be part of a conversation about the human aspects of medicine, the meaning of what we do, and, especially, end-of-life care. I never thought I’d be part of it in a personal way, but rather in a way related to policy. But stories move people, and stories are important. It’s turned into something else that’s bigger — much bigger — than just a book tour. Please send any information about Paul's book. I need some kind of support. My sister Linda was diagnosed with stage 4 lung cancer last week.We aredoing going crazy!!!!! Where should I start. I'm lost. She's currently hospitalized with pneumonia. Dear Sharon, we’re very sorry to hear about your sister’s diagnosis. “When Breath Becomes Air,” the book by Paul Kalanithi, can be purchased at bookstores everywhere and online at sites like Amazon and Barnes & Noble. Thank you for your comment, and best wishes to you and your family. We're very sorry to hear about your sister. Our love and very best wishes to you all at this trying time. Please check out the page we maintain at https://www.facebook.com/whenbreathbecomesair for more details about the book, links to articles, videos, etc. You can also reach out to us privately from that page if you'd like any additional information. How did your husband's cancer diagnosis change the way you practice medicine? Do you think Paul's love of literature made him a more empathetic doctor, even before he was a patient? What's the purpose of this book tour and why are you doing it now?